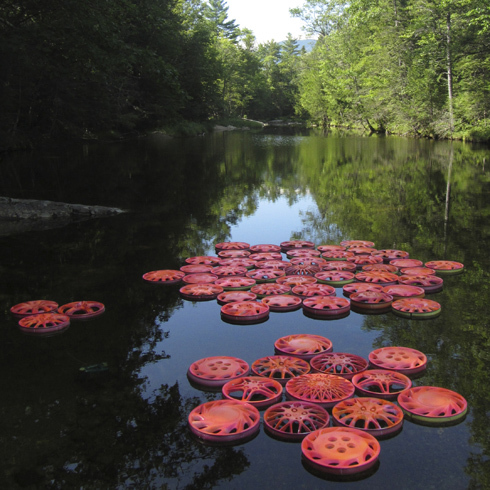 Susan Champeny creates public art murals, mosaic, and recycled materials sculpture. Her goal is to inspire wonder and surprise the viewer by creating memorable objects and images. She received grants from the Worcester Arts Council and the Massachusetts Cultural Council to bring sculpture-building workshops to after-school programs and to paint images of the city of Worcester in her signature colorful and playful style. Three of her public artworks are in the city of Worcester: two are mural-based, and the other is a mosaic. Her artwork is featured in the collections of institutions in Worcester, the Massachusetts State House, and several private firms. Her recycled sculptures have been installed as far away as California, Georgia, Hawaii, Georgia, and Kansas. A graduate of the Massachusetts College of Art with a major in Printmaking, Susan worked for 20 years art directing magazines. This skill set has led naturally to her guiding community participation and group art-building projects, which has become a key component of her artistic style. Her business plan is based on three principles: create, have fun, and travel.